Oral hygiene is the practice of keeping one’s mouth clean and free of disease and other problems (e.g. bad breath) by regular brushing and cleaning between the teeth. From a young age we are all encouraged to brush our teeth twice daily, but in reality – this often doesn’t happen. At many practices your dentist will complete your regular scale and polish, but where you may have perio disease or infection you will often be referred to a Dental or Oral Hygienist. We have two Oral Hygienists here at Boyne Dental & Implant clinic. 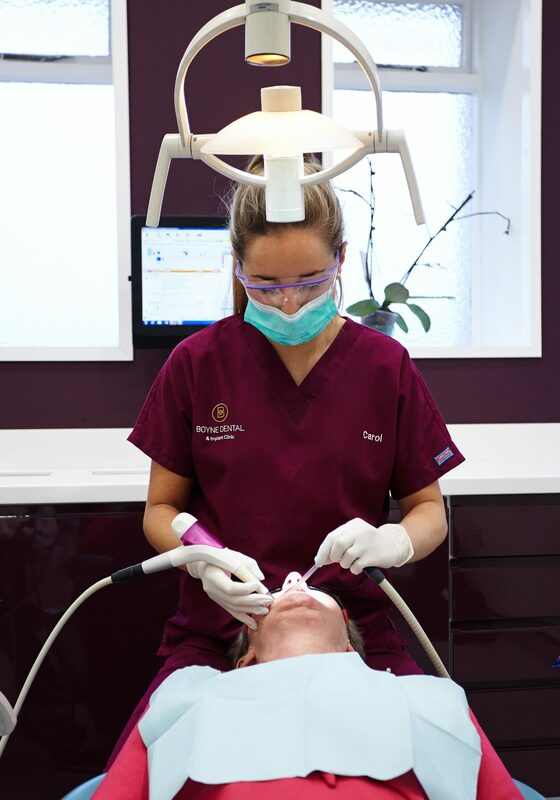 Our hygienists will work alongside your dentist to provide you with full oral health care. They will not only maintain your current smile to be as clean as bright as it can be, they specialise, where needed, in the prevention and treatment of oral diseases. They will also advise you on how to turn around your own care of your mouth and teeth in a few simple steps. Your dental hygienist can remove most tobacco, coffee and tea stains. During your cleaning, your hygienist will also polish your teeth to a beautiful shine. The result? A whiter and brighter smile! Every visit to our hygienists will have you running your tongue along your teeth with satisfaction. Hygienists help the dentist assess the best treatment plan which could reduce or even eliminate your recurring dental problems. Having a great smile may open more doors for you, but it also helps keep you healthy once you get inside. Preventive dental work is essential for your health, and your teeth and gums will thank you for it over and over. Make the most of your smile. It’s the only one you have! Call our Patient Care Team today on 049 -9033309 to start your journey today. It is a state of being free from mouth and facial pain, oral and throat cancer, oral infection and sores, periodontal (gum) disease, tooth decay, tooth loss, and other diseases and disorders that limit an individual’s capacity in biting, chewing, smiling, speaking, and psychosocial wellbeing. Your hygienist will start with teeth cleaning (unless otherwise directed by your dentist). Teeth cleaning is the removal of dental plaque and tartar from teeth to prevent cavities, gingivitis, gum disease, and tooth decay. Severe gum disease causes at least one-third of adult tooth loss. Tooth decay is the most common global disease. Where necessary your hygienist will create a treatment plan for Periodontal Therapy. Where your dentist has advised that this will be a necessary course of action for you, it will be initiated following plenty of discussion with you. Your hygienist will explain step by step of the process. To ensure success of your long term goals and results, your understanding and buy in to the process is important at this stage. What are common oral diseases? Oral diseases ranging from cavities to cancer are all serious threats to your oral health. … Gum Disease — Gum disease is one of the most common dental problems adults face, but gum disease can begin at just about any age. Gingivitis — Gingivitis is a term used to describe inflammation of the gums. Make regular visits to your dentist for a checkup and your hygienist for cleaning. How can gum disease affect me? Recent studies have linked heart attacks and strokes to gum disease, resulting from poor oral hygiene. A dental cleaning every six months helps to keep your teeth and gums healthy and could possibly reduce your risk of heart disease and strokes. Since gum disease is one of the leading causes of tooth loss in adults, regular dental check-ups and cleanings, brushing and flossing are vital to keeping as many teeth as you can. Keeping your teeth means better chewing function and ultimately, better health. Dental studies show that about 85 percent of people with persistent bad breath, also known as halitosis, have a dental problem that is to blame. Good oral hygiene is essential in preventing bad breath. Regular check-ups and cleanings are the best way to make sure that you are maintaining good oral hygiene. Airflow - What is it? Airflow cleaning is a simple way to effectively remove surface stains from teeth. The system uses a focused jet of compressed air, water and bicarbonate particles to gently polish away surface staining from the teeth. It does not lighten the base colour of your teeth, but it will leave them better prepared if you are considering whitening.